John Shipley raised to 250,000 on the button. Sami Kelopuro re-raised the pot to 850,000 from the small blind and Ben Lamb folded from the big blind. Shipley thought it over for about a minute before four-betting all in, resulting in a quick all-in call from Kelopuro. The flop came down , to which Kelopuro commented, "Not bad." The turn was as safe as can be for Kelopuro, only needing to dodge a jack on the river to survive. The river delivered the , securing the double for Kelopuro. 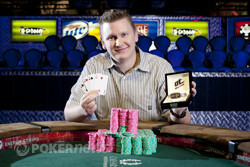 Sami Kelopuro raised to 200,000 on the button and Ben Lamb three-bet to 700,000 from the small blind. Christopher King went all in from the big blind for about 1.1 million, getting Kelopuro to fold. Lamb called and the hands were revealed. King was in a good spot to double, but Lamb took control of the hand when the flop rolled out to give him a flush. King was drawing dead when the hit the turn, making the river irrelevant. After King wished his tablemates good luck, Lamb turned to Kelopuro and said, "All diamonds, eh?" "When you're blessed, you're blessed," John Shipley added with a grin. Sami Kelopuro opened to 230,000 on the button, and Ben Lamb and Christopher King called from the blinds. The flop fell , and the action checked to Kelopuro who continued for 400,000. Lamb announced, "one-point-three million," King mucked, and the action was back on Kelopuro. He too folded his cards, and Lamb took down the pot. Christopher King (from the big blind) called a John Shipley cutoff raise and saw an flop fall. Both checked to see the turn where King fired 250,000. Shipley raised it to 1,050,000, forcing a quick fold from King. 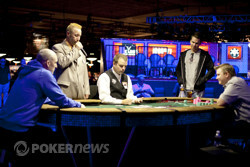 Here we are again, another stellar event at the 2011 World Series of Poker is down to the wire. This one, Event #42: $10,000 Pot-Limit Omaha Championship, has four players remaining. Leading the charge after Day 3 and into Day 4 is Ben Lamb with 4.335 million in chips. 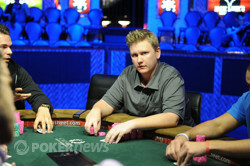 This is Lamb's second final table here at the 2011 WSOP. Earlier this Series, Lamb took second place to 24th-place finisher in this event Sam Stein. For his runner-up finish in that event, Lamb earned $259,918. 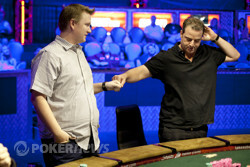 This run is Lamb's tenth WSOP cash and third WSOP final table. In 2009, Lamb made a super deep run in the WSOP Main Event, finishing 14th for $633,022. 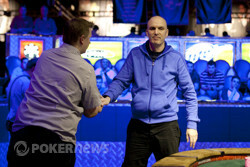 John Shipley from England sits in second place with 2.705 million in chips. Shipley has 13 WSOP cashes on record, making this his 14th. He has five WSOP final tables previously and his best finish on record in a seventh-place finish in the 2002 WSOP Main Event that was won by Robert Varkonyi., Shipley took home $125,000 for that finish, the second largest score of his career. Already guaranteed nearly $275,000 here, this is now the second largest score of his career. Sami Kelopuro has no WSOP cashes on record, but that doesn't mean he's a complete rookie. Kelopuro has played several WSOP events, just hadn't had the run he needed to make the money. He's making this one count though, as the young Finn finds himself in the final four of one of the most elite tournaments during the Series. He's in third with 2.155 million in chips and plays a very aggressive style of play, so anything could change quickly with him. Christopher King has 1.645 million in chips coming into the final four on Day 4. 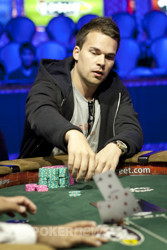 King is a real estate developer from the United States and is making his first-ever WSOP cash. He's made the run all the way down to the final table, but it's going to take some work if he wants to climb out from the bottom of the barrel to win this one. The final table is set to kickoff at 3:00 PM PT, so stay tuned to PokerNews for our coverage as we will surely crown a winner in Event #42 today!